William Henry Goss set up his first pottery factory at Stoke on Trent in 1858, at the age of 25. He had been trained in potting by the Copeland family, who ran the Spode works, which was next door to his own factory. He experimented with making parian porcelain and produced busts and ornaments in this as well as other materials. In 1870, William had moved his factory to Sturgess Street in Stoke. Here, in 1883, his son Adolphus joined the firm. Adolphus noted how the lower classes were now able to travel further (due to the expanding train network) and had more spare time and disposable income than ever before. A market had developed for souvenirs for people to take home from their day trips out, helped by Queen Victoria, who had made seaside bathing popular. 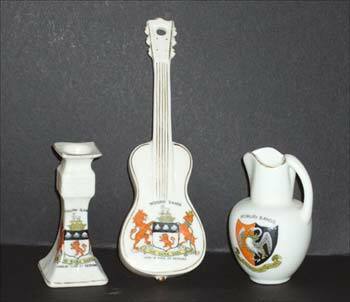 From the 1870’s, Goss had been producing small vases and pots with the Arms of Colleges and Schools on for presentations. Adolphus realised that these would make ideal small cheap items to produce with any town names and crests on. These were instantly successful, and Adolphus travelled the country, and eventually around the world, signing-up agents to sell from, as well as drawing pictures of the local scenes to send back to the factory for new designs. By 1900, Adolphus left the firm after disagreements with his father, so he handed over the firm to two of his other sons, Victor and Huntley, just before William died in 1906. Victor died in a riding accident in 1913 and Huntley was left in charge of the business. However, the firm was not interested in moving with the times, and he would not even have a telephone installed! The Goss firm was sold out to Cauldon Potteries in 1929, but the name of Goss continued to be used. Eventually, by liquidation and amalgamation, it became part of the Royal Doulton empire. The success of Goss spawned many imitators of a slightly lesser standard, such as those by Arcadian, Swan, Coronet and Willow Art. There are only two actual Goss pieces for Woburn Sands, both from the late period, (e.g. after 1929) a shallow dish with a colour transfer picture of either St Michaels Church, Aspley Heath or the Henry VII Lodge, Woburn Sands. The smaller manufactures had more than made up for the sparseness of actual Goss, with many different shapes of vase, animals, clothing, sports goods and transport, usually decorated with The Arms of the Duke of Bedford, but occasionally the heraldic Swan of Buckinghamshire. These were produced from about 1905 – 1930. 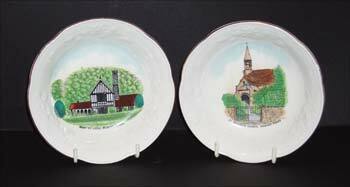 There are also items by Wirths Dolhain, small objects of frosted glass with hand-painted local scenes on. Some Woburn Sands crested pieces have a stamp underneath, reading “G. Tansley, High Street, Woburn Sands”. 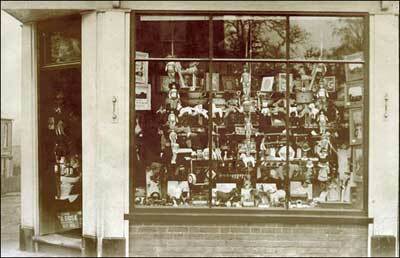 George Tansley ran a china and glass shop at 27 High Street. He also produced stoneware hot water bottles with his name attached! The prices today for crested pieces range from the relatively cheap, at a few pounds, to extremely expensive, such as WWI related models like the Zeppelin, but grouped together, they make a very attractive display. There are other non-crested souvenirs which also turn up occasionally, such as cups, shaving mugs and plates, all made for the masses of visitors who came to Woburn Sands and Aspley Heath to ‘take the airs’ and wanted a small gift for friends or a keepsake for themselves. These are collectable too. Woburn Sands – Crested China Collection Here you can see the huge variety of shapes and objects stamped with the local Crest of the Duke of Bedford, or a local scene, and sold as souvenirs to the tourists, who were attracted to Woburn Sands and Aspley Heath because of the reputation of the pine woods as a health spa. Gemma Trinket Box, Tuscan Pin Dish. 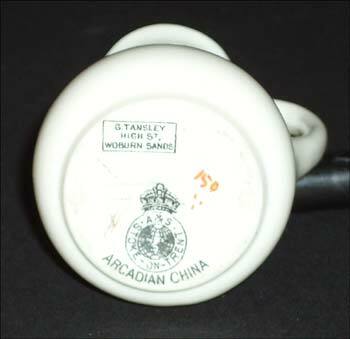 Below, a German-made Cup. An unmarked Mug, Arcadian Shaving Mug, still with Timothy Whites wrapped soap, and bottom, the only two proper Goss pieces, transferware of the Henry VIIth Lodge and St Michael’s. If you have any other crested Woburn Sands items, and would like to add them to this page, please contact me.